Drive straight to the North or South terminal at Gatwick Airport. If you are using the M23 turn off at Junction 9 or follow airport signs from the A23. Follow signs for ‘Short Stay Passenger Pick-Up’ to the short term car park; keep in the right hand lane. Take a ticket at the barrier (there is nothing to pay). Drive to Orange car park and head for level 1, Parking in Rows D & E.
At the North Terminal roundabout, exit onto Longbridge Way, the shell garage will be on your right. Go straight over, following the brown signs for Hampton by Hilton Car Park and Approved Operators. When you get to the Approved Operator area park up in an Approved Operator Bay. If travelling from North Terminal: Drive to the Hampton By Hilton, hotel car park. At the barrier please enter the code 1992 and drive to the far end of the car park to the meeting point. If travelling from South Terminal: Drive to Orange car park and head up to level 1, Parking in Rows D & E.
An Ace driver will greet you and park your car in the company’s nearby compound. Head into the terminal to start your holiday early. Please call Ace on the number provided once you have collected your luggage and cleared customs to request your vehicle returned. Simply give the Ace team a call from the arrivals lounge. Head to the designated meeting point. As you leave the North Terminal Customs’ area, head towards the Terminal’s main exit doors. Just before the exit doors, take a lift to the 1st floor following the signs to the Hampton-by-Hilton Hotel. Continue past Hotel reception, through the automatic doors and along a walkway until you arrive at the lift. Having entered the lift, select LEVEL 0/ "APPROVED OPERATORS/HOTEL CAR PARK" and exit lift. 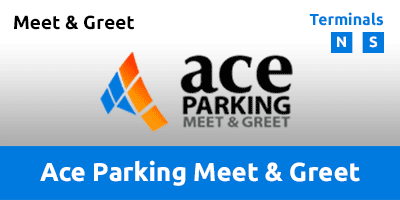 Your car will be returned to one of the RESERVED ACE/Maple Manor Parking Bays (numbered 1-35).